Cheech told the Richmond News that he's developing a sitcom for VH1 which he will direct and star in. It will debut this fall. "When asked about Tommy Chong and their very public and contentious professional break up - after an incredibly successful 15-year career that spanned eight feature films, and gut-splitting humour - he only says: "We are on pretty good terms... he's fine and he goes back to Vancouver often." Cheech was promoting the July 29th Cheech Marin & Friends comedy show at the River Rock Casino in Richmond, BC. He has a lot of appearances scheduled promoting the event. See "Current Events" on the right. An interview with The Georgia Straight will be posted tomorrow. The full transcript will be posted here. Update: Here's another article from The Province. "The great thing is, I'm really Iranian, but I've got this Mexican thing going. Honestly, thank God for typecasting. It makes the public remember you and gives you a long career. It amazes me I have an audience now that goes from womb to tomb." What was originally supposed to be an article promoting the Simon & Schuster book The I Chong: Meditations From The Joint, turned into a full-fledged article regarding the on again/off again Cheech and Chong reunion. This week's issue of Entertainment Weekly also discusses the reasons for the original break-up, including new and old quotes from Cheech and Tommy. The explanation of what caused the break-ups seems to change depending on when and where you ask Cheech and Tommy. The EW article is fantastic. When they were still together...According to Cheech and Tommy, Tommy (the director) would come up with the plots and Cheech would tell him which of those ideas would work. Cheech eventually wanted to do drug-free films. That's why they decided to do The Corsican Brothers. Even though the film is great, it didn't do well at the box office. Shortly thereafter, they broke up, partly because Cheech was "resentful of Chong's increasing dominance." According to Tommy's book, Tommy says they broke up because Chong's family did such a great job in the Corsican Brothers and Cheech realized he wasn't essential for the film to succeed. Based on what we've heard, we here at Cheech and Chong Dot Com find this reasoning hard to believe. The book goes on to say that each of their egos is responsible for their split. The reunion...While in jail, Cheech and the director, Larry Charles, met with Tommy. Both Cheech and Tommy agreed to pen a script together. However, after he was released Tommy took it upon himself to write the script on his own. Tommy wrote the script, but Cheech refused to read it because he didn't want to be "subservient" to Tommy. Chong says there's a possibility of a reunion, but it would be like Grumpy Old Stoners because they're older now. Cheech has been contacting Tommy through his manager about doing a musical thing together. Tommy isn't interested because he's not a "backup guitar player." Fans have informed us that Tommy still makes jokes about Cheech during his stand-up act. Nothing too bad, just the occasionally fun poke. As it stands now, each is writing an Up In Smoke play. Upon completion, they will most likely combine the best of both plays. Tommy says the reunion isn't happening anytime soon, but Cheech is optimistic. 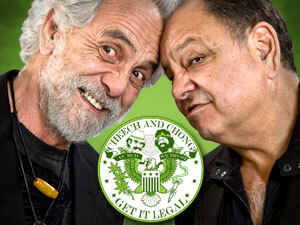 We here at Cheech and Chong Dot Com don't think the play would be a success. C & C fans would rather see them doing stand-up together or seeing them in a movie. To prove our point look at Latino-Logues (directed by Cheech) and Marijuana-Logues (starring Tommy). Both were hysterical, well done plays. However, each play had low attendance except for weekends. It wasn't until Marijuana-Logues was taken on the road that it became successful. In fact, nearly each show was sold out. We don't have any details on this, but Tommy says he's now working on "one of the biggest-grossing movies ever in the history of the world." Hopefully, he's not referring to Evil Bong, a low budget film which he stars in. It's in post-production. On August 12th, Cheech Marin will present an award at the 24th Annual Golden Boot Awards. Clint Eastwood, Ann-Margret, Joan Leslie, Powers Boothe, Buddy Van Horn, Leslie H. Martinson and Wes Studi to Be Honored. Established in 1982 to recognize those performers, stunt AWARD people, producers and directors who have furthered the tradition of the Western on film and in television. During the past twenty years, Golden Boots have been awarded to such notables as Gene Autry, Roy Rogers, Clint Eastwood, Jack Palance, Melissa Gilbert, Clayton Moore, Sam Elliott, Tommy Lee Jones and Tom Selleck. No word yet on whether or not it will be televised. The event takes place in Beverly Hills. The infamous outlaw, Bobby Capps, attended Saturday's opening of Cheech Marin's Latino Art Exhibit, Chicano Visions. If you recall, Bobby peformed numerous "Free Tommy" stunts during Tommy Chong's incarceration. He's a huge Cheech and Chong fan so he drove out to San Fran to see Cheech. Unfortunately, Cheech called out sick. He came down with a mild case of the flu shortly after doing press on Friday. Here is Bobby Capps' coverage of the event. Golden Gate Park In San Francisco the picture of perfection as God painted up a sensational day for art lovers. The mood was somber for the moment as patrons single filed into the de Young Museum to get a first hand glimpse of Chicano Visions. My perceptions of the art works was that it was simplistic but very meaningful. While the spectrum ran from one end of talent to the other, the paintings and vignettes were without a doubt very vibrant in color and stood out boldly. From religious, political and positive attitudes of life's struggle the time passages seem to have a common denominator. The artist all seem to bond in a family oriented way. That brown skinned people want to be free from a racist society and just want to be themselves free of the chains of slavery that bind them from reaching freedom. Family unity and faith were the main contrast. The art was bestowed in paintings, vignettes, shrines, and of the traditional Chicano ways of life. Some well known figures were prestige in glass cases such as Oscar Dela Hoyas picture along with a pair of autograph boxing gloves. Legendary guitarist Carlos Santana's picture holding one of his guitars while that guitar itself stood proudly in another glass case along with his Grammy award for Corizone Espinado. Brown bandanas sometimes known in areas of the streets as Dew rags were given away free in the spirit to say I am Chicano and proud to be it. Today's visitors even if not of a Mexican American decent was Chicano day for anyone sported this symbolic gesture. Adults of all ages admired their favorite piece of this fabulous collections of work while their children played with low rider thumpers toys set up like video games. Even some of the older men still couldn't let go of the little boy in them to try their hand at the high bouncing automobile. I must say I was very happy to see the children in the museum were well behave and not running around. When asking a few people of their view of Chicano Art I received a very good reprise. Pepe Adriazola (Peru) youth worker in S. F. screamed softly to me counting, "This is about Family,Tradition, and Unity for brown skinned people everywhere." Denise Wilson S. F. " I thought it was well rounded and educational!" Denise was sitting at a 1950's Cafe style booth which had the music selection for a quarter juke box. When I walked by to see it Denise was so still and looking at the selection I thought she was a model manikin set up to perceived the memories of the doo-wah day. We enjoyed a great laugh as I sat down across the booth and enjoyed her smile of joy she was getting out of the art show. One Nun (Tennessee) had no opinion and claimed she couldn't be printed. One man sporting and Irish ball cap, had no clue what so ever what any of the works were trying to say. His entire journey was based on giving his 4 year old something to do to keep her occupied on daddy's day. One entire area was set up to exemplify Cheech Marin's life at home in the early years. With a small love seat style couch and two end tables looking into two televisions which showed a tape of Cheech's family and a second which shown Cheech. I began to feel sad. It was more like visiting a memorial and that Cheech had left us for a free and better place. I must say I did not like this one particular scene. Most of the other visitors were very quite in this part of the museum. As the day moved on and we exited the exhibit a full band was set up in the Foyer of the building. 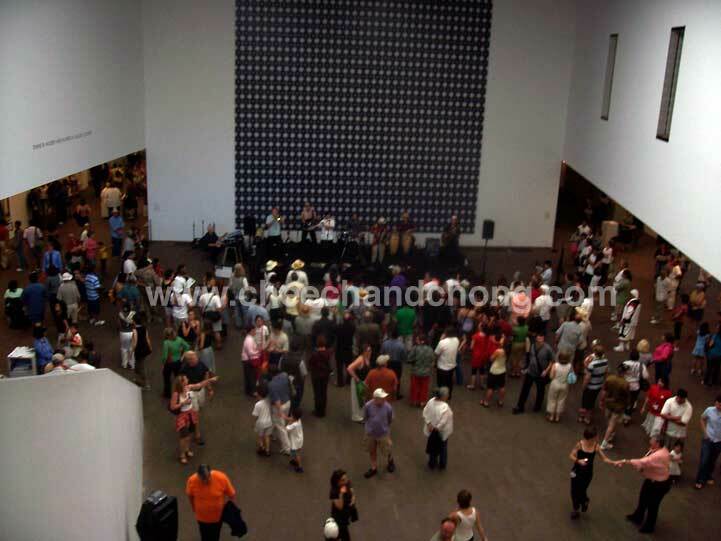 The body jumping room bumping blazing red hot Baja sounds of Dr Loco and his Jalapeno Band filled the crowd with delight as they cheered on a Chicano sax players Pied Piper Styles. An estimated 5000 people toured the exhibit of The Cheech Marin Chicano Visions Art Show. within two hours. But sadly this art show was a no show for the legendary Pioneer of Comedy. It Seems Cheech called in sick at the last minute. Even though Mr. Marin did not make his appearance the crowd didn't seem to be displease. With a sidewalk show of stilt walkers and hot beat drummers (Loco Blaco) to the fine style of the inside music I would have to say that Rene Yanez, Rio Yanez and Rene Baldocchi and a host of many other employees represented Cheech Marin's American Expression and Chicano Encounters in a positive manor. A large portrait of Cheech Marin adorn the exit of the exhibit as if to say. " Thanks for coming to hear and see our lives" and a flurry of books and pictures were for sale as you left. Seven artists were on hand to autograph the copies of books displaying their works. I enjoyed the tour immensely For this Outlaw It was a steal of a show because opening day had free admission. Try to see the show. This is almost as funny as when Cheech accidentally hit spectators in the head with golf balls at a charity golf tournament last year. At this year's American Century golf tournament in Tahoe, Cheech Marin was paired with John O'Hurley and Mathew Settle (from Band Of Brothers). Update: Cheech's score was far less than stellar. The infamous Cheech Marin turns 60 today. Cheech was born July 13th, 1946 in Los Angeles, CA. By the way, more dates have been added for Cheech Marin and Friends: Up In Jokes tour. Check out the dates in "Current Events". Cheech Marin, half of the hilariously irreverent '70's comedy duo Cheech & Chong, plays ringleader to various comedians. The Irvine, CA show has comedians Russell Peters, Katt Williams, Gabriel Iglesias, Ralphie May, Lisa Lampenelli and Mike Epps. Tommy Chong has hired Gadget's Culver City machine shop to turn the frame of a 1946 Oldsmobile into an electric car. "Chong's ride will be the first all-electric vehicle to bounce down San Fernando Road competing for glory with the 60s-era Chevy Impalas of the Imperial Car Club." He calls the car "ACE". MTV will be following the progress. Chong presently drives an Impala. On July 8th, Cheech Marin hosted Guitar Center's Guitarmageddon King of the Blues competition at the House Of Blues in Chicago. Matt O'Ree of Holmdel, NJ was the winner. Tommy revealed this on "Tom Green Live". Clip #1: Tommy talks about Jim Carrey. And here's a misc audio clip of Tommy on the Rise Guys radio show in North Carolina. Tommy sarcastically said Cheech recently reached out to him..."he had his manager call him". He also comments on his daughter, Rae Dawn Chong. Tommy Chong will be performing in Marijana-Logues August 5th at the Royal Oak Music Theatre in Royal Oak, Michigan. This is to make up for a date he had to cancel because of his probation. Tommy's keeping busy because Josh Gilbert's film a/k/a Tommy Chong is playing at Michael Moore's Traverse Film Festival that same night. Tommy Chong is a super-intelligent individual. This shouldn't be much of a surprise to people who have met Tommy or seen one of his shows. To be a good comedian or actor you really need to be intelligent. His thoughts and advice on life improvement are profound. The part of the book where he discusses the horror of living in a children center when he was growing up was very touching. His mom had tuberculosis and his dad was recovering from injuries from the war. He and his siblings lived there for a short period of time while they got better. Tommy calls it the first time he was in prison. The book also discusses joy-riding as a teenager, Cheech teaching Tommy meditation, as well as Tommy's close relationship with his wife Shelby and his children. The book only briefly mentions the split of Cheech and Chong. This was probably a good idea. Readers don't want to hear the same things Cheech and Tommy have already told the press. He thinks it's their egos that caused the split, both his and Cheech's. In addition, Tommy discusses his time at Taft Correctional. The other prisoners and guards, for the most part, treated him well, but it was in no way a picnic. He had his chores to do and had to be on time for four counts each day. Another prisoner taught him how to build a kiln in the ground using old railroad ties so he could make pottery using the clay he dug up. This is the type of stuff he did to keep busy. Towards the end of the book, he says he's witnessed prison corruption. The I Chong: Meditations From The Joint is well-written and easy to read. It's funny, thoughtful and sad. We don't want to give it away, but you'll enjoy the shower story! The final edition will include eight pages of photos. Up for auction is a framed autographed tee-shirt by Tommy Chong along with other souvenirs from his tour at the Keswick Theater on May 6, 2006. Tommy Chong was originally scheduled to perform the Marijuana-Logues at the Keswick Theater on March 18th, 2005, but the tour was cancelled due to violations of Tommy's parole because of reported incidents of audience members throwing joints on stage. Tommy returned to the tour circuit when his parole ended in 2006 and was finally able to finish his 2005 tour. When he came to the Philadelphia area on May 6th 2006 for two shows at the Keswick Theater, William Haney graciously requested Tommy Chong to sign this tee-shirt in support of medical freedom. This one of a kind autographed shirt has been preserved with a black marble shaded matte, high quality wooden frame with acrylic sheet. The frame measures 34" by 25" and has an acid free back. The autographed tee-shirt is accompanied with several related historical souvenir items including the original Keswick Theater ticket stub for the Marijuana-Logues, a theater program for the show, a custom black bronze name plate honoring Tommy's comeback tour, and a newspaper interview with Tommy from the Philadelphia Daily News dated May 2, 2006. Ironic enough, when Mr. Haney contacted reporter Stu Bykofsy for a copy of the interview, Mr. Bykofsky sent Mr. Haney the actual newspaper, and the postmark on the envelope was May 24th, the Birthday of Tommy Chong! These two items will be sent along with the framed items. There is a spot on the back of the frame to house these two items. Mr. William Haney plans to donate a part of the proceeds to four non-profit organizations that benefit medical marijuana reform groups and they are: The Philadelphia Chapter of Norml, Women's Organization for National Prohibition Reform, The San Francisco Patients' Cooperative, and The Coalition for Medical Marijuana of New Jersey. Update: auction postponed til August. Cheech Marin was the Grand Mashal at this weekend's Nascar Nextel race. Cheech isn't an experienced race fan. Some quotes from Cheech about race cars... "They go fast, it's really loud and chicks dig it. So how bad can it be?" and I've never been to a race, but "I was in a race riot one time." Cheech had never been to a race.